The U.S. Navy's X-47B completed its final test aboard USS Theodore Roosevelt (CVN 71) and returned to its home base at Naval Air Station Patuxent River after eight days at sea. 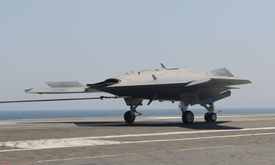 Northrop Grumman Corp. and the U.S. Navy have completed the first arrested landing of the X-47B Unmanned Combat Air System (UCAS) carrier demonstration aircraft on the deck of the USS George H.W. Bush (CVN 77). Northrop Grumman Corp. and the U.S. Navy have conducted the first fly-in arrested landing of the X-47B Unmanned Combat Air System (UCAS) demonstrator.